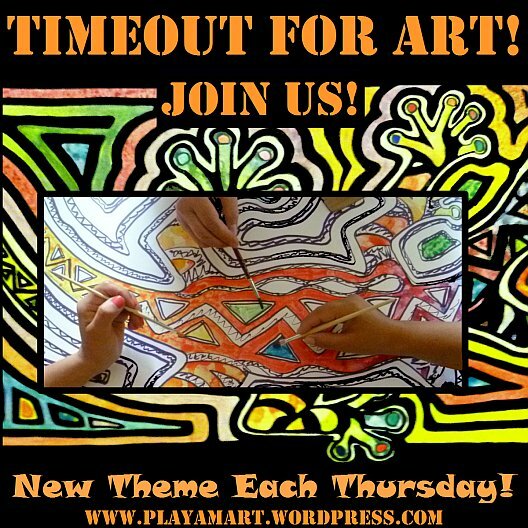 This week’s Timeout for Art will surely inspire a few of you to purchase a package of modeling clay, a small-to-medium sized pumpkin and start having fun! From Little Rock and Monticello Arkansas, I introduce you to three unique pumpkin heads! The following photos illustrate a fun option for creating October mascots! We mixed red and yellow to make orange and smoothed those colors over the green and red. Thinking ahead, we allowed room for the white eyeballs. We also formed and set aside thin strips of orange for the eyelids. Using thick areas of clay allow for more believable contours. We pressed the indentions for the eyes. At times we absently scratched through the final color but easily repaired those areas. Placing red on one side of the nose helped emphasize the crooked line! First pumpkin- Finished! … Next pumpkin, please? True to the nature of siblings, the second pumpkin evolved into a different personality! These two stayed behind in Little Rock! For a few dollars, you can have fun with Halloween art; if you don’t have a pumpkin, use an orange or a winter squash or even a coconut! Grandma, what big eyes you have……very nice work, Z. Great job! Love the eyes. thank you! it was fun! I know where I can find a coconut, now to find the clay! Nice job Amiga. ha ha ha ha! you might be able to scoop some from a river bottom on your next trip over the mountain! surely there’s some red clay that would work! How FUN!! and a blessing to share time and fun with your sister!! You just never cease to amaze me Zeebra!! Your first picture was like….mmmmm…what did she come up with now??? second was kinda the same mmmm but each new one got me smiling and by the last one I was not just smiling with a huge grin but in total amazement!!! Lisa you are such an inspiration to me and so many others with all of your talent…..and all I can do is thank God for the blessings you impart to me and many many others….What a great idea … only you would think to use clay on a pumpkin along with the suggestion to use an orange, winter squash or EVEN a coconut to make something so different and special for Halloween!! Hugs and Blessings to one of my most favorite friends!! thanks, bb! i’m glad that i’m still able to surprise you, and i’m glad that you liked the pumpkin art. maybe you can do that project with your group of friends there in panama! thanks so much, you’re here in spirit! Talk about being creative, wow! What a great idea to sculpt the clay onto the pumpkins, it’s unique with amazing results. Perfect ~ hope you are enjoying your time in the States. ha! thanks! i’ve had time to buy clay and pumkins but zero time to look at computers.. still hobbling along with the burrito! Fantastic! Isn’t it great to just go to the store and buy whatever you need to create these whimsical pumpkins? I’m going to try this with coconuts, but maybe instead of using clay, which I can’t get here anyway…I’ll paint them into pumpkins. It looks like you are enjoying your time with your family! Go Lisa! Picking a favorite is too much like picking a favorite of your children. Impossible. What fun! Being a nose person I love the beaks! Love them!!! Shall have to try this with the grandkids 🙂 Thanks Lisa. Superb and what fun. A welcome relief to inpsire anyone’s creative juices. Thanks Z.